3:15am. 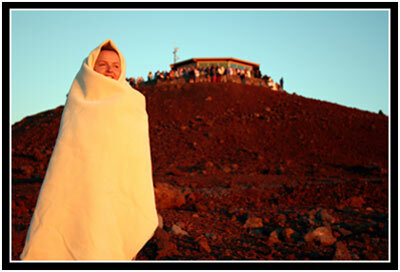 That’s how early you have to get up to beat the sunrise to the peak of Maui’s tallest volcano, Haleakala. When you’re staying in Kihei, that is. We had packed the night before, so we were out the door fifteen minutes later. 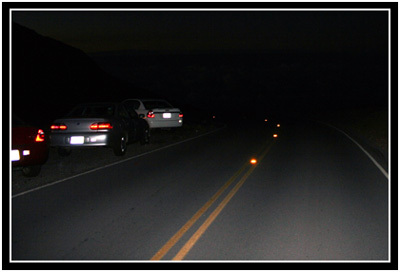 The roads of Maui are essentially deserted at 3:30am, at least until you start climbing the winding Haleakala Highway up the volcano. Even before dawn, cars group up and ascend in clumps. Although tired, Oksana and I enjoyed the dark ride up the mountain. Below us were thousands of lights (and what looked to be a large sugarcane fire) illuminating the flat valley between Kahului and Kihei. Above us, the Perseid meteor showers were at their height and even with my attention focused on the steep curves, I couldn’t help but see half a dozen bright shooting stars in the clear mountain air. The park itself is open 24 hours a day, even though the entrance may not be staffed. We coasted to a stop at a place where the cars lined behind a ticket vending machine. Many drivers had exited their warm cars and were standing in a line with their arms crossed and their shoulders hunched against the cold. Some guy couldn’t get the machine to accept his wrinkly old ten, so to get the line moving again, Oksana traded him a crisp $10 bill. Of course, when her time came, no one would exchange theirs for the dog-eared reject. She came back to the car, grabbed a twenty from my wallet, and soon returned with 10 silver dollars in change. By the time we neared the peak, the sunrise was very much underway. The sky to the east was reddening and I desperately wanted to find a parking spot so that I could set up my video camera. I thought that a time-lapse of the event would make a nice companion to the one I shot in Peru. We followed the car in front of us up past the visitor’s center thinking that they knew of parking opportunities that we did not. Sure enough, around just a few more curves, the summit’s observation hut came into view. We pulled into the parking lot… and pulled right back out again. The lot was full and the car we were following was the very first to be turned away. I thought about following our leader back down to the visitor’s center, but then spied a relatively flat area along the shoulder. 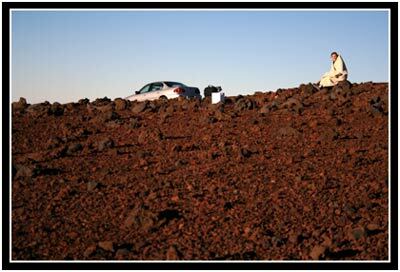 Our car barely had enough clearance to avoid the larger lava rocks and still get off the paved road. I worried that some park ranger would come scare us off, but within minutes of pulling over, other victims of the summit lot overflow pulled in behind me. Oksana and I quickly changed into warmer clothes and grabbed up all our technological gadgets. In just a couple minutes, I had staked out a small area in the field of crunchy, loose lava and had the camcorder attached to my laptop. As soon as it was recording, I sat back to relax and watch the sunrise. 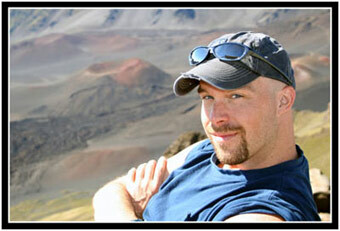 It was cold up there at around 10,000 ft, but not so cold that I uncomfortable in just jeans and a fleece pullover. 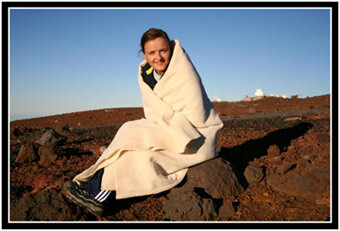 Oksana was happy once she wrapped herself up in a blanket we had the foresight to bring with us. 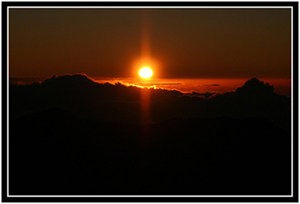 Sunrise at Haleakala is an unforgettable experience, one that Mark Twain called the ‘sublimest spectacle’ he’d ever seen. […] About an hour before sunrise, the night sky begins to lighten and turn purple-blue, and the stars fade away. Ethereal silhouettes of the mountain ridges appear. […] The gentlest colors show up in the moments just before dawn. The undersides of the clouds lighten up first, accenting the night sky with pale silvery slivers and streaks of pink. […] About 20 minutes before sunrise, the light intensifies on the horizon in bright oranges and reds, much like a sunset. 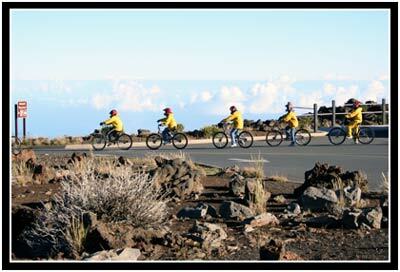 […] For the grand finale, the moment when the disk of the sun appears, all of Haleakala takes on a fiery glow. It feels like you’re watching the earth awaken. Or Mars. You wouldn’t know it from a drive up in the dark, but most of the rocks and soil in the area around the peak are deep red. When it was finally bright enough to take a look around, it didn’t look so much like the Earth to me. And for what it’s worth, the sunrise was spectacular. I don’t need to put into words what I can show with a video clip, but suffice it to say that it lived up to the guidebook hype. And the author is right; the best part is just before the sun appears. In the 60 seconds or so before that moment, I kept saying, “Wow!” over and over again, each time more emphatically than the last. It was like watching a sunrise from an airplane. Except that clouds slowly boil in front of you instead of scream past at 500mph and there’s no piece of scratched Plexiglas separating you and the warmth of the sun. I’m quite sure that my camcorder did not capture the sublimest silvery silhouette subtleties that were there, but the video is a great memory catalyst. As the sun rose higher, Oksana and I waited near our video equipment. Having seen what they had come to see, the horde above us left the heated observation room and drove past us on their way down the mountain. 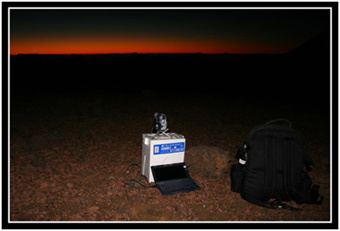 I passed the next half hour or so taking pictures of the sunrise, the volcano, Oksana, and the observatory behind us. When almost everyone had gone, we packed up and drove up to the peak for a look around. 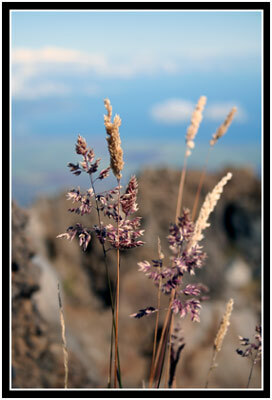 The top of Haleakala is a pleasant enough place when it’s quiet. 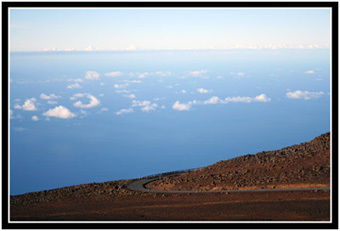 Off in the distance, you can spy the peaks of The Big Island, and to the west, almost all of Maui is spread out below you. 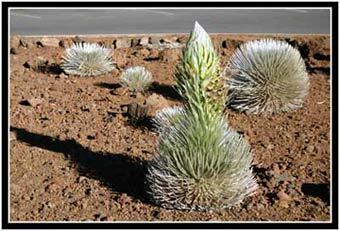 Even the parking lot has been well maintained, with a tiny refuge in the center for Hawaii’s state plant, the silversword. Oksana and I decided to walk around a smaller peak bordering the visitor’s center, just to get an alternate view of the crater. At the overlook, the tiny people kicking up dust clouds on the trail down into the it gave us an idea of its scale. We hadn’t come prepared for the 5-mile hike to the nearest cinder cone, let alone a full-day trek across the valley floor. We contented ourselves with the view, though, and reassured ourselves that, after getting up at 3:15am, a nap seemed just as attractive. Back on the road down the mountain, we came to a conspicuous fork. I decided to turn the car toward the sunrise and see where it took us. We found ourselves at a covered shelter – either the Leleiwi or the Kalahaku Overlook – perched above the Ko’olau Gap. The clouds looked as though they were going to stream through the gap and into the crater, so I ran back to the car and set up another time-lapse recording. No luck, though. In the 45 minutes we were there, the clouds simply ebbed and flowed at the entrance. It was perhaps 10:30am, five hours after we had arrived at the summit, when we decided to drive back to Kihei (and we were fully engaged in our much-needed siesta by noon!) Next time, I’ll remember to bring better hiking shoes, plenty of sunscreen, and maybe even some camping gear. 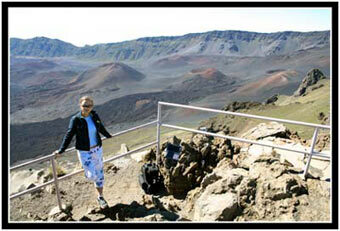 I have a feeling that I could lose myself for days exploring Haleakala. 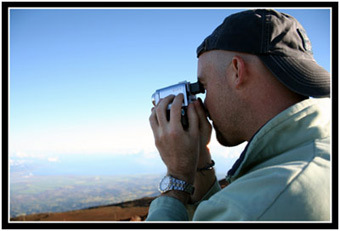 Having spent 15 years on Oahu as a teenager and young adult, I visited Maui some 10 times and never once got out of bed in time to view the sunrise at the “house of the sun.” My first visit to Maui came as a high school graduation gift. I spent a week there with my two best friends. We would plan to get up at 3 a.m., but once the hour arrived we just couldn’t summon ourselves to rise and shine! We did visit the summit, though, just not for sunrise, so that’s still on my list of things to do. 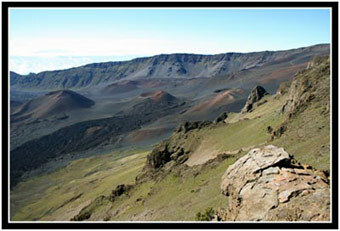 If I had a lot of money, I’d probably be living in Kula at about 5000 feet in elevation on the mountain. Great article and pictures, Arlo!